Lack of snow and newly crevassed areas forced CPS on Monday to delay planned tests of equipment slated for a spring 2010 Greenland Inland Traverse (GrIT). The tests would have begun later this month, but after discovering a 15-foot deep crevasse in an area previously thought to be stable, and encountering a transition zone that had receded more than expected due to summer melt, the crew determined the planned test should be postponed, said Jay Burnside, PFS construction manager. “The earthen terrain is made up of cobbles and, although it's possible, it's not feasible to cross without an adequate snow road,” he said. Originally a small crew, including snow and ice experts from CRREL, planned to spend several weeks this fall studying snow temperatures and determining the best way to minimize friction between the sleds and the snow. 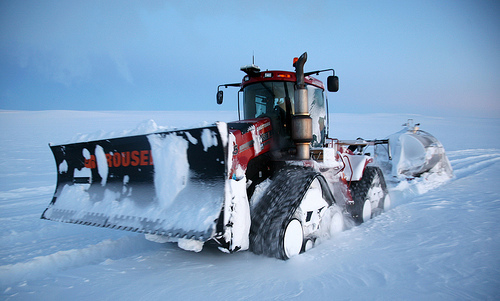 At issue is an effort to improve the mobility of sleds pulled by over-ice tractors as CPS attempts to establish an overland traverse that could eventually provide reliable transportation from Thule Air Base to Summit Station. An inaugural traverse was completed in 2008. The crew wanted to test conditions in September to capitalize on natural light and stronger snow conditions than those found in the spring, Burnside said. Although they could wait until later this season to conduct the tests, doing so would result in the team “running into shortened days and poor weather as we did last year during an equipment recovery in late October,” said Burnside. But the lack of snow, the unexpected crevasse and a nearby moulin (drain hole) raised enough feasibility and safety issues that the team decided to postpone the tests and analyze the area with ground penetrating radar to identify the safest route before setting out with heavy equipment. Though disappointed by the delay, Burnside said the recent discoveries yielded important information. In addition, the team learned that August is the best time to capture ground imagery when the majority of crevasses are open. Burnside noted that all is not lost: Prior to leaving, the team will complete planned maintenance on the heavy equipment, thus forestalling the need for another visit scheduled for December. Still, the GrIT team is disappointed. “The intent of our trip was to fast track our understanding of the snow/sled interface on traverse sleds,” said Burnside. “Last spring we discerned that the largest mobility issue we had was with the sleds and not the tractor. It was twice as difficult to pull those same sleds in Greenland as it was to pull them in the Antarctic. So we recommended a trip in the fall to test theories about the sleds in the real environment.” Two ice experts from CRREL who have already completed computer modeling analyses would have joined Burnside in Thule later this month to ground-truth the results with on-the-ground observations. Now, the GrIT team will look forward to spring.